The CoffeeShop Blog: CoffeeShop "Storyboard Set #24, 5x7 for Print or Web"! CoffeeShop "Storyboard Set #24, 5x7 for Print or Web"! Today I have a new 5x7 professional photographer storyboard set to share with you. You can change the colors of the borders and the text box on bottom and print or post them on the web. They are both layered Photoshop/PSE files so you can add your images using clipping masks (tutorial and free action). In my examples above I used the Ostrich Sans font. I hope you find these useful!!! Original images in the B&W storyboard (fur hat, swimsuit, tattoo, woman in black shirt). "Vintage Val" images by Jill Wellington (Etsy Shop, Facebook, Blog, YouTube Videos, Pixabay). 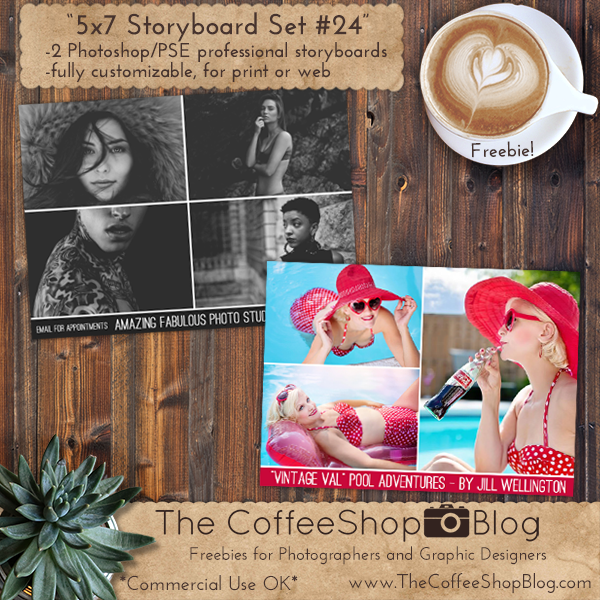 Download the CoffeeShop "5x7 Storyboard Set #24".